1 of 1 Heat oven to 400 degrees . Unroll crust and fit into a standard 9-inch pie plate. Flute edge as desired and refrigerate while preparing filling and topping. 1 of 1 In a large bowl, combine apples, golden raisins, 1/3 cup of the granulated sugar, the lemon juice and ground cinnamon. Toss to coat and let stand for 10 minutes. 1 of 3 In a medium bowl, whisk together flour, oats, brown sugar, cinnamon and salt. Cut butter into mixture with a pastry blender or rub between your fingers until crumbly. Stir in sliced almonds. 2 of 3 In a small bowl, combine remaining 2 tbsp granulated sugar and the cornstarch. Sprinkle over apple mixture and toss to combine. Pour mixture into crust, mounding slightly in center. Cover with topping and transfer to oven. 3 of 3 Bake at 400 degrees for 25 minutes. 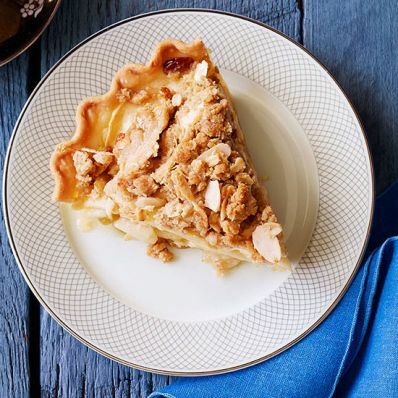 Cover pie with foil, reduce oven temperature to 325 degrees and continue baking for 20 to 25 minutes, until apples can be easily pierced with a small knife. Cool at least 30 minutes before slicing.